The bitter arctic to-the-bone chilling frost gripped New York City Friday morning so mercilessly, it made us create this disturbing list. Brace yourself with a mug of hot beverage. So, how cold is it in the New York City? It broke a record. The temperature dropped to 2 degrees Fahrenheit shortly before 8 a.m. in the Central Park, breaking the record on this same day in 1950, when the National Weather Service (NWS) registered 7 degrees Fahrenheit. It’s a health hazard. The wind chills reached -16 degrees Fahrenheit, making the NWS issue a special announcement. At that temperature exposed skin gets frostbite in about 30 minutes. 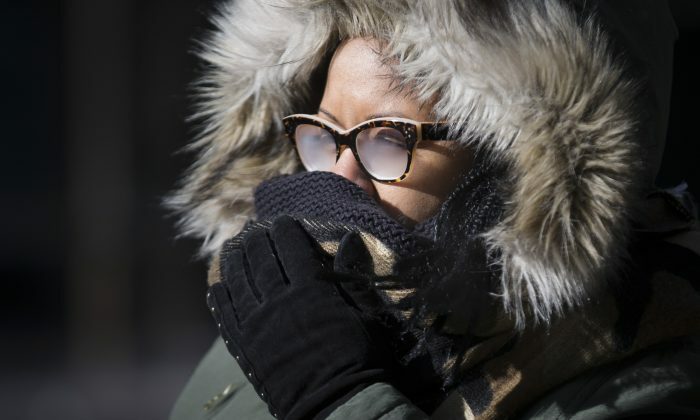 Wind chills will reach -10 degrees Fahrenheit for the rest of the afternoon, the NWS warned. People use drastic similes without exaggerating. Some commuters in front of Penn Station transit hub spontaneously described the weather as “brutal” or compared it to Siberia. None of them seemed to be joking in the least. Weather maps turned purple. Picture in your mind weather forecast maps showing those nice warm shades of orange in summer and cold shades of blue in the winter. Well, they turned purple for today. The lighter the shade of purple on such maps, the closer you are to an icicle. It’s literally colder than the North Pole. What was the temperature at 10 a.m. on the North Pole? A comfy 8 degrees Fahrenheit, according to Weather.com. New York City? A dreadful 6 degrees Fahrenheit, according to NWS. Hudson River froze! Well, almost. Twitter pictures show a majority of the river is covered with ice on the eastern bank along Manhattan. If travel is necessary, make sure you have disaster supplies in your vehicle which include: shovel, blanket, flashlight, water, snacks, first aid kit, extra batteries, sack of sand or cat litter. When shoveling snow, take frequent breaks to avoid risk of injury or cardiac arrest. Make sure coats, gloves or mittens, hats, boots, and warm clothing are available for all household members, along with extra blankets. Researchers found spending time outside in the cold boosts levels of brown fat in the body, which helps people lose weight. Here's a list of measures to make your cold weather run more tolerable than it was last winter.